"So, I went this really great little cocktail bar in the East Village last week called Death & Co."
"Good grief, another one of those so-called 'speakeasies' serving cocktails with 150-year-old recipes so strong you pass out after the second round?" "Hey now, this place was the real deal. And it's not a speakeasy. It's not hidden, and there's a bouncer out front." "You don't need to get a password from an old phone booth in some dark corner of the Lower East Side?" "No, nothing like that, although you'll probably have to put your name down and wait for a table or spot at the bar. It's a small place, holding a maximum of about 30 people, and they don't let you stand around." "I have to give my name?" "Yeah, but it's not that bad. My husband and I went around 8:30 on a Saturday night and had to wait about half an hour. We wandered around the neighborhood a bit and checked out a nearby used records store." "You don't have to stand around outside waiting in the cold?" "No, you can leave. The guy at the door takes your cell phone number and calls you when a spot opens. I suppose if they were really slammed you might even have time to get a drink first someplace else; there are plenty of other bars and restaurants nearby." "Huh, that's not too bad. But what's it like inside? I'm really over dive bars serving overpriced cocktails." "It's not a dive, it's really rather nice inside: dark interior with wood paneling on the ceiling and, as you'd expect, the polished stone bar is the centerpiece of the long, narrow main room. Seating is divided between the bar and a few tables for two to four people. It strikes a nice balance of being both contemporary and classic, just like their drinks." "Ah yes, the important part. I tell you, I'm really over all this obsession with drinks from 1890. Why can't we drink like it's 2015?" "At Death & Co, you can definitely drink like it's 2015. The bar menu is incredible: seven of its eight pages focus on original creations, all of which are $15 except the punches. Drinks are divided by spirit: gin, rum, agaves like tequila and mezcal, whiskey, brandy and two pages of specials, with each page then subdivided between shaken and stirred drinks. A final page is for classics, but they aren't your typical old-school drinks. For example, there's the Cameron's Kick from the 1930s classic The Savoy Cocktail Book made with Scotch and Irish whisky, lemon, orgeat and Angostura bitters." Death & Co also published a book last year, which I reviewed. "That sounds pretty promising. What were your drinks like?" "We liked everything we tried. Because we'd just eaten Mexican, we were in the mood for more tequila and sampled three drinks from the agave page. I started with the Sierra Madre, a drink that nicely displays the complexity of the cocktails they make. Its base is mezcal infused with coconut and green tea and mixed with lime juice, pear brandy, vanilla syrup and ginger syrup, making for a refreshing tart and sweet drink. That's a lot of flavor components, but they melded nicely. I liked how I could still discern the subtle hint of vanilla amid all the other flavors. Chris's first drink was the Fever Dream, which was mezcal infused with chiles and mixed with suze, elderflower liqueur, lime, simple syrup, cucumber and celery bitters. His drink was just spicy enough without being overbearing and nicely balanced." "Those both sound really good. Did you get a second round?" "Of course! My second drink was the Kinsale Cooler, a refreshing blend of gin, Manzanilla sherry, suze, elderflower liqueur, lemon juice, celery bitters and seltzer. Although this drink shares several key ingredients with the Fever Dream, it was completely different--a bit bitter with the sherry really coming through. Chris stayed on the agave page and had the Age & Treachery, a wonderfully brown and caramelly mix of tequila, mezcal, amaro, apple syrup, Angostura bitters and sarsparilla tincture." "It's amazing how many ingredients are in each of those drinks. It must take the bartenders ages to make them. I suppose they have to look each one up in some recipe book." "Remarkably, no. Our bartender made each of these drinks from memory. I was so impressed and told him so, which elicited a big smile." "No doubt through his waxed handlebar mustache." "No, he didn't have that hipster-bartender look. He seemed like a pretty normal guy." "And he provided good service too?" "Definitely. We were given waters the minute was sat down and didn't have to wait very long for our drinks to be made. They kept the water refills coming and our second round came shortly on the heels of our first. It was a much better service experience than when we went to that other big-name cocktail bar in Soho." 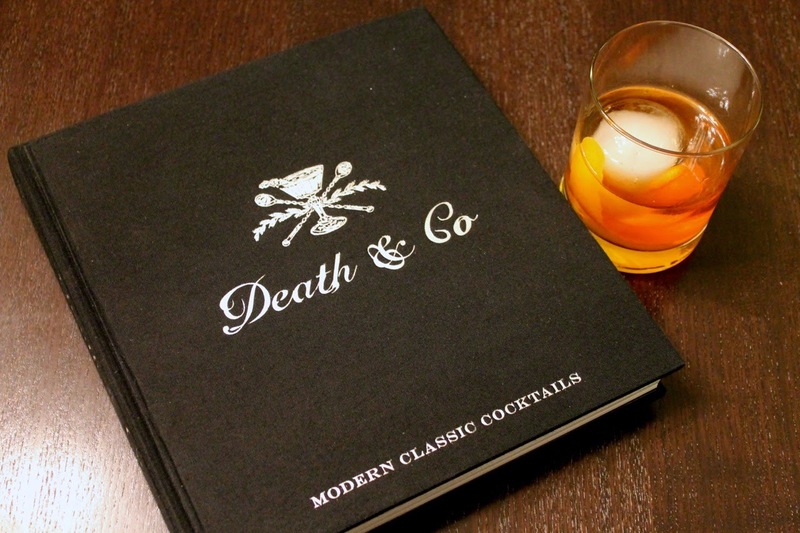 "Death & Co. was really a fantastic bar experience in every way. 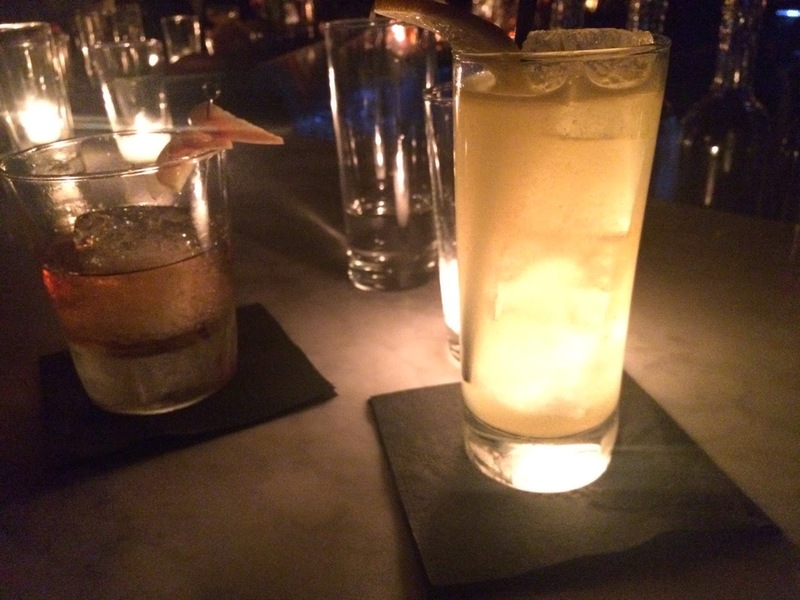 Excellent, creative cocktails in a cool atmosphere with friendly, efficient service. I would definitely go back." "And I'll be coming with you." Death & Co, 433 East 6th Street (between 1st Avenue and Avenue A), New York, NY (Manhattan, East Village). (212) 388-0882. No reservations. Can I interrupt this conversation to point out that besides making us great drinks, the bartender was also very cute. Yes, he was. I thought about pointing that out, but decided to stick with describing his professional skill.